Tokyo Otaku Mode™ (TOM), a worldwide distributor of otaku content including anime, manga, and cosplay, as part of Tokyo Otaku Mode Inc. (incorporated in Delaware, U.S. by President and CEO, Tomo Kamei), has launched its own otaku news page (http://otakumode.com/article) within its main site, TokyoOtakuMode (http://otakumode.com). Tokyo Otaku Mode Inc. has been providing the world with the latest otaku-related news through Facebook since its inception, and now, with TOM’s recently launched news page, even more articles are available that are easy to read and informative. Users have access to the latest anime and manga news, merchandise information, interviews, reports on events, and other otaku-related news articles straight from Japan delivered daily in English. The articles are divided into 12 different categories, making it easy for users to browse news they are interested in as well as access archives of previous articles. Users can also share their favorite articles with their friends through Facebook and Twitter. TokyoOtakuMode’s content are also being used on other sites such as the renowned U.S. news media site, Huffington Post, and one of the largest social humor platforms, Cheezburger. Along with the release of its news page, TokyoOtakuMode has also ended the invitation-only access to its website. Visitors can now freely view all of the content available on the website, as well as sign up and upload their own self-created content. With its full website launch and the newly opened news page, TokyoOtakuMode aims to become the world’s No. 1 otaku lifestyle portal by providing the latest news from Japan to the world. Tokyo Otaku Mode™ (TOM) was created on March 24, 2011 by President and CEO, Tomo Kamei. TOM was incorporated in the state of Delaware, U.S. in April 2012. TOM began on Facebook (http://www.facebook.com/tokyootakumode), the world’s largest social networking site, as a page for introducing news and events related to otaku content to the world. Within 22 months of operation, TOM has accumulated over 9.8 million Likes on Facebook, becoming the largest Facebook page run by a Japanese company. TOM’s website (otakumode.com) is now open to the public. 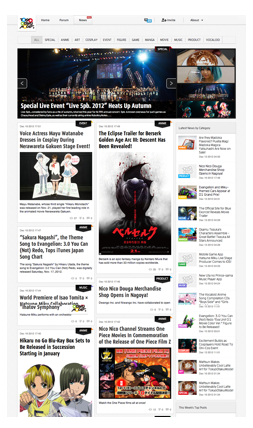 With the newly launched website, users can enjoy otaku-related news and upload their self-created content. TOM’s new web service will provide a platform for fans and hobbyists of otaku culture to share content, connect with one another, and for content-creators to be fully credited for their work. TOM hopes to create a community of respect between content-creators and fans, while enriching the otaku lifestyle and contributing to the global entertainment market.